These are widly used as Koji for Miso, soy sauce and commercial-Koji. Medium aerialmycelium type. Slow growth in the beginning of Koji incubation period, having good penetration and scent. Used for Miso. Medium aerialmycelium type. This has high enzymatic activity. Used for tinted Miso. Medium aerialmycelium type. This is good for mechanical production of Koji because of its fast progress. Easily used because of its strong neutral protease. Medium-short aerialmycelium type. This has strong saccharification enzymes. Making Koji is easy. Good for sweet Miso. Long aerialmycelium type. Non-dark and non-black pigment of Koji fungus. Plain taste and scent. Medium aerialmycelium type. Rapid growth in the beginning of Koji incubation period. This has good scent and become white Koji. 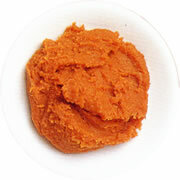 Used for red type Miso. This has high β-glycosidase activity (7.14/g Koji) which transforms glucoside type isoflavone into aglycon type. This contains Asperatine which gives more particular amino acids than other Tane-Koji (starter) appered on the market. (Concession no. 3113959, FERM AP-20647). 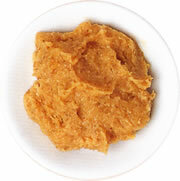 This has more free fatty acid than commercial Koji for Miso by 16 times which plays important role in scent of Miso (1.6g/100g Miso) (Concession no .4049220, FERM AP-20562). This has high γ-amino butyric acid. Its no.77 have dark and black pigment (44mg/100g Koji) and no.20 dose not have (39.8mg/100g Koji). Short aerialmycelium type. Strong enzymatic activity. Early decomposing. Early nurturing spore. This has strong protease and early propagation. This Tane-Koji draws out taste of beans. Tane-Koji (starter) used A. sojae. Short aerialmycelium type. Making time of Koji is short. High using rate of nitrogen. A. oryzae type. This has high protease activity and good scent. Easy to use. A. oryzae type. 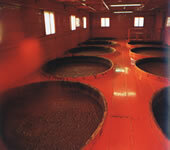 For tint color of soy sauce. High amylase activity.